Ooooh this really trips up my mind wondering if it is water or clouds, up or down. Excellent shot. Now that’s thinking outside of the box. Clever woman. The lake never gets dull. Oh tricky tricky Ms. Magtree! to generate a moment of confusion — HOW did she do that??? Followed of course by a rather abashed shah! oho! Very nice, very effective. 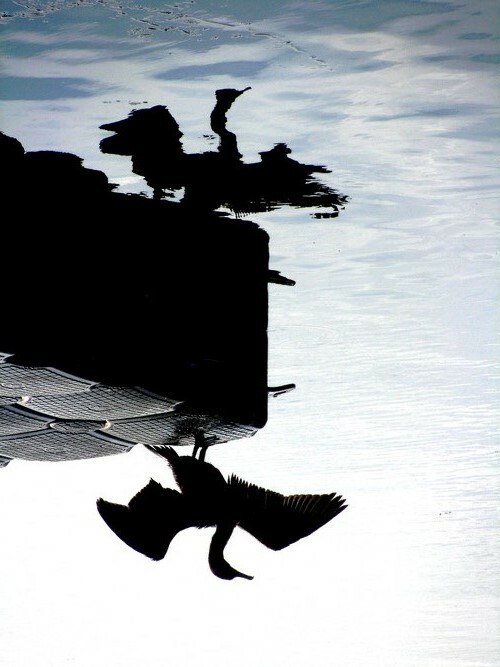 I love how the watery sky world seems much realer than the “real” world, and the heron (or cormorant?) becomes a kind of Platonic reality of birds in general, bird spirit, shall we say! Lovely. I love the striking silhouette (and reflection), almost monochrome with just that hint of blue, and the symmetry of this shot. And it’s a mind-bender. For the first couple of moments we think we know what we’re seeing, then feel disoriented, then realize … aha! The sky and water blend so beautifully into each other. Oh, fabulous!! And, though it is a lovely picture right side up, it is absolutely brilliant upside down. It’s amazing how much the reversal adds to it.